It happened eighteen years ago. But, I remember it well. Chad and I were long-distance emailers. I guess that’s the most you could say about our relationship at the time. We had been friends for several years, but he graduated from college and moved away to Nashville. In true star-crossed-lovers fashion, he confessed some sort of “like” for me just before he moved fourteen hours away. Email was new technology for us, and since we couldn’t really afford to talk on the phone we wrote pages and pages of emails to each other. I still remember the sound of the dial-up internet cranking up while I waited anxiously to see if I had a new message from him. He couldn’t know it, but by the time the end of the first summer had rolled around, I was madly in love with him. I tried to act nonchalant about it all, as if I could take or leave him, and maybe that’s how I opened the door for Tanya. The sound of her name still makes my blood boil. I knew something was wrong. His emails were short. His tone was strained. A few days later he confessed that he had made grilled cheese sandwiches in his rotting little house on Chamberlin Street for a girl named Tanya, and afterward he walked her to the car and she kissed him. Yes, he kissed her back. I kept up the it’s-really-none-of-my-business-what-you-do act, but inside I was crushed. I was furious. And I wanted to give this girl Tanya a piece of my mind. Don’t worry, I didn’t. I never met her. He decided he would never see her again, the emailing marathon continued, and a few months later we were officially dating. A few months after that, we were engaged. And, here we are, married for fifteen years, with three kids and an amazing life. And, I still feel jealous when I think of Tanya. Why do I feel that way? Well, it’s because I love Chad. I love him so much that my heart is repulsed at the idea of him loving (or even liking) anyone else. I suppose Oprah heard these words, and with the shallow and ungrounded theology she had been taught, she imagined God as an abusive husband, keeping his wife locked inside, spying on her, ready to step in at any moment to knock her down. She must have pictured an insecure, small God. But, thankfully, we don’t get to make up in our own minds who God is. Scripture is perfectly clear that God is holy, perfect, without flaw or fault. There is no ounce of insecurity or pettiness in Him. Does He love us deeply and demand our fidelity in return? Or course. But, this demand is born of His love, not an imagined insecurity. John MacArthur describes God’s desire to see us fulfill our purpose for living, which is to know Him: “God says I tolerate no rivals. You were made to know Me. You are Mine. I made you for that purpose. I tolerate no intruders.” He doesn’t intend to share His people with other gods or lesser objects. MacArthur goes on to say that even just failing to love God with all our heart, soul, mind, and strength is an indication that we have placed other things on a higher plane than Him. And, in His sovereignty, in His rightness, in His holiness, He has every cause to burn with jealousy when that happens. 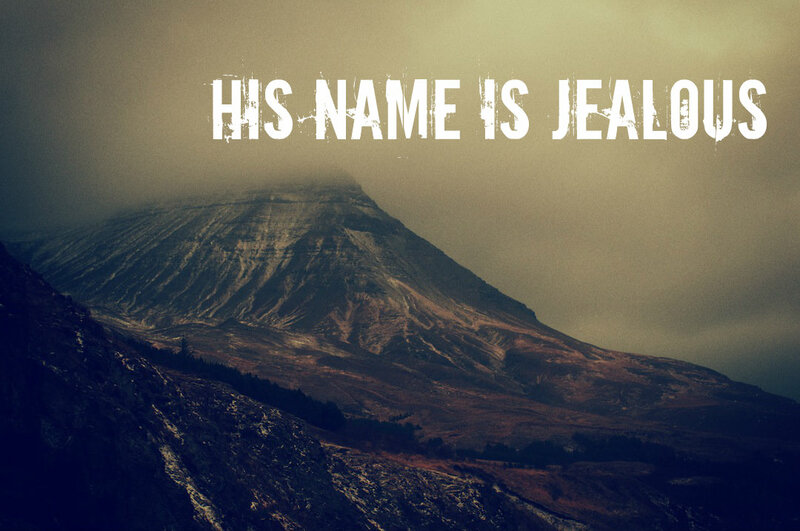 God’s jealousy is nothing like an abusive husband’s. It’s not even like an emailing eighteen year-old’s. His jealousy is borne of holiness, a demand for complete devotion, and a desire to see us live out our full potential as His creation: people who know Him well, and who love Him completely. I don’t know if I personally will ever stop feeling jealous when I think about that kiss-stealing Tanya girl. But, I do know that I have, for all these years, felt great satisfaction in knowing that I won him in the end. I suppose tonight the question on my mind is just what it is in my life that is keeping me from running to God with all of my heart, all of my mind, all of my soul, all of my strength? What in my little world inspires jealousy in my God? I know God wins me in the end. I am safe in His hand and can never be snatched out of it. (John 10:29) But, will the lesser objects that interfere with my love for Him keep me from living out the fullness of this life? A life that is meant to glorify God? His name is Jealous. His love is fierce. His devotion is complete. May I tear down the idols in my life with both hands. He is jealous for me. …If your neighbors are not envying your relationship you should re-examine, refresh and relaunch it. If your single friends and relatives are not longing for your kind of marriage, something is wrong. Except that it is completely unrealistic and is actually harmful to married people. Well-intended ideas like this have led millions of men and women to decide that their perfectly normal marriage is bad. Could I please reveal a few truths about marriage? Did you know that when people get married they still have to go to the bathroom? Totally true! Not very romantic! Married people have bills to pay. Married people have to go to jobs that take up the majority of their time in this life. Married people get schooled by tantrum throwing toddlers. Married people experience childbirth together. And it’s not all blood-free and clean and funny like it is on TV. It’s scary. And it hurts. And afterward there is a crying baby. For months. Which reminds me: Married people are short on sleep. Married people get annoyed by each other. All of this happens in happy, normal, well-adjusted, sweet, loving marriages. We have gotten it into our heads that marriage should be a total mountain top experience at all times or it’s just a doomed failure. But, there are times when life is crazy and the two of you are just trying to survive the chaos. Marriage also goes through lots of phases. There are the we’re-cohabitating-and-not-killing-each-other phases. In solid, strong, healthy marriages. It’s so sad that we have let Oprah’s relationship experts and 20 year old girls on Facebook and romantic movies convince us that the only kind of love that’s acceptable is the one that has all the neighbors envying you. The truth is, we could all put on lots of “marriage shows” that convince people we are a certain way. In fact, I know people who’ve done it. Everyone was certainly shocked when they filed for divorce. But, follow any couple, even the greatest couple you know, for a few days, see every interaction they have with one another, and you will see what is really beautiful about marriage. It takes a lot of forgiving. It takes a lot of overlooking glaring faults. It takes a lot of work and perseverance when the mountaintop isn’t even visible. And, when you do that, when you work hard at it and love and honor and build trust and hold fast during the worst times, some people may notice and think you have a good marriage. But, I wouldn’t count on it. Because in the real world, marriage looks like two people dealing with lots of unpleasant stuff together. It doesn’t have to look effortless. That’s not our goal. It doesn’t have to look enviable. It’s about doing what you said you would do, no matter what. If you do that long enough, people will notice. But, your marriage isn’t broken if it doesn’t look like a Nicholas Sparks romance every day. Let the neighbors envy the pretend marriages they see on TV. In you, just let them see that you are loving with all your might, even if that love takes the form of cleaning vomit out of the back of the minivan. In my world, that’s true love. Jealous?